In the competitive world of adventure travel, the small adventure travel companies can sometimes get lost in the shuffle. Which is a shame, because they can provide the ultimate in personalized service — you’re often dealing with owner of the company as you plan your trip. These small companies may also offer departures at a very attractive price, something to be grateful for in these tough economic times. Typically, these operators choose comfort over luxury when it comes to accommodations, and the best ones try to integrate you with the local culture rather than cocooning you in a fancy hotel. Vancouver-based BikeHike Adventures is one of those companies. They have departures to 27 countries, many in Asia and Latin America. And their prices are in tune with the times. 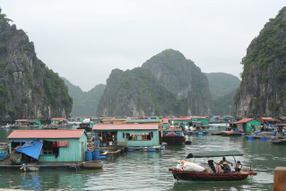 A 12-day "Paddle and Play" in Vietnam that combines mountain biking and sea kayaking is $2,299. And voluntourism takes on fresh meaning with "Ecuador- Adventures with a Purpose," an 11-day trip that combines days of community service with mountain biking, rafting, sea kayaking and hiking and costs $2,199. Trips like these are why BikeHike Adventures was singled out as "One of the Best Outfitters in the World" by National Geographic Adventure in 2007. I ran into company founder Trish Sare in Brazil last month and decided to follow up with her when I returned to the States. So Trish, where are you now? At present, I am in Vancouver, British Columbia. I’ve recently returned from three weeks in boisterous Brazil, which was fabulous. I was at the Adventure Travel World Summit conference, the cream of the crop of this industry, as well as designing some new BikeHike Adventures. 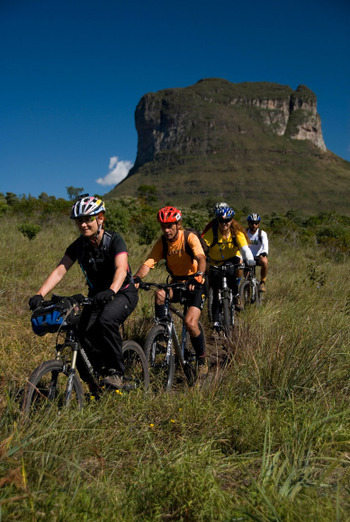 What makes BikeHike Adventures stand out in the rather crowded field of adventure travel? We want our clients to interact first hand with the local people, by riding their bicycles alongside the locals, stopping into family houses along the way when we get invited to try a local delicacy, or attending an impromptu wedding because we’ve just been invited by the locals. I want to offer those types of experiences to our travelers, not the staged "tourist experience," but real life encounters. We are a business, but more importantly, we are an experience and we’ve developed a community of friends to share those experiences with. We are all about personalized attention and service for every single person. We are a smaller company and really don’t have the desire to be one of the big players. I don’t want to get to a stage where I can’t personally speak to clients, or travel with clients. I always want to have the personalized service for everyone. We have so many clients who come home from our BikeHike Adventures with a new outlook on life and who want a new career path. They call us inquiring how we got into this industry and how they can make the changes to do something with their lives that they love, like travel. I tell them my story, which I think is very interesting. Well, then tell us a bit about your background and when BikeHike Adventures was founded? My mother died very young, at the age of 46. She married young, had children young, and never had the freedom to get out and see the world, which she always wanted to do. Before she died, she told me to live my life for today, because you never know what tomorrow holds. She told me to go travel the world. This made a huge impact on me, and I gathered the courage to set off from my hometown of Toronto on a five year journey, working my way around the world, at the age of 20. My first stop was Vancouver, where I stayed six months, working at Expo 86, the world’s fair. I loved Vancouver, and I returned to settle here 20 years later. From Vancouver I spent a year traveling through the Pacific Islands, Australia and New Zealand. The following year was Japan, Singapore, Malaysia and finally I reached Thailand. I worked on a fishing boat, as a waitress, a receptionist at an accounting firm, and taught English. In Japan, there were all sorts of interesting one day jobs including work in commercials, and as a model for hair salons. 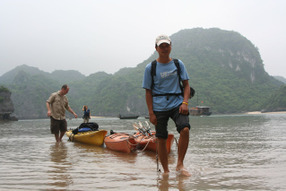 Once I got to Thailand fell in love with a local, a sea kayak guide, and stayed for two and half years. Then I returned to Toronto, and worked for a tour operator in Costa Rica and went all over South and Central America, leading trips. I started to become a real expert on South America and it was here that the seed of inspiration for starting my own company were planted. I had a dream of doing it, and I had absolutely no idea how it was going to happen, but it did. With $1,000 of savings, I organized a tour of my own, to Costa Rica, just to see if I could do it. That was our "Coast to Coast Adventure in Costa Rica". There was no internet back then, so it was all micro-marketing, doing slide presentations. I marketed through fitness clubs, since I was a fitness instructor as well. Through a lot of hard work, my first tour sold out at 12 people. As you can imagine, I was elated. I grew very conservatively at first, by adding a few more departures, then a couple of other countries each year. 2009 will mark our 15 year anniversary and it has been an incredible ride along the way. I love what I do more than anything. I really feel I have the best job in the world. Five years ago I finally moved back to Vancouver, where our headquarters is now. How would you characterize the BikeHike Adventures approach? 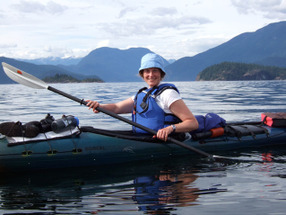 We offer worldwide adventures that are fun, active, and off the beaten track. We offer authentic cultural encounters and opportunities where our clients can meet like-minded travelers. There are four levels of trips (easy, moderate, challenging and strenuous) to fit the needs and desires of all travelers. Sustainable tourism is crucial to us and we only work with socially and environmentally responsible suppliers around the world, ensuring that the local people are gaining from our being in their countries. We stay in small family-run boutique hotels and we support local restaurants that are socially responsible. For example, in Vietnam one restaurant we dine in is KOTO, a not-for-profit restaurant and vocational training program that works to train and assist street and disadvantaged youth in Hanoi. On most of our fixed departures, we stay in 3-star hotels, and we have a few trips which are at a higher level, in 4 star hotels. But we always use smaller boutique hotels that are locally owned to ensure that profits stay in the country and the local people are the ones benefitting. How about the demographics of your travelers? Our average age range is 25-55 with most in their 30’s and 40’s, and those clients are the ones who booked our fixed departures. We are also customizing many trips now for families with kids ages 5 and up and parents in their 40’s and 50’s. This is a huge growing trend we’ve seen in the last few years. We also customize lots of groups of friends, all women groups, birthday parties and anniversaries. Tell us about your voluntourism trips? Volunteer trips is one of the biggest search terms that people use to get to our site. It is definitely a growing trend, especially for the youth and elderly, the ones who have the time. We’ve developed multi-sport volunteer trips for the 25-55 age range because generally these people can’t go away on a volunteer vacation for one month or more. They have limited time and still want a vacation but also want to give back. A typical volunteer multi-sport itinerary may be 10 days with three days of volunteering in an orphanage, planting trees or maintaining trails, with seven days of biking, hiking and rafting. How about your guides — do you work with people who are based in a given destination or do you send guides overseas? All of our guides live and work in the destinations that we operate in. Some of them are foreigners, but have been living in the destinations for most of their lives and are married to locals whom they have families with. This is the perfect scenario for us because they understand the high expectations that we have for safety, and top-quality, exciting itineraries. Many of our guides are also born and bred in the countries that we operate in. They speak many of the indigenous languages, i.e Swahili, Quechua, as well as fluent English and the main language of the destination. All of our guides are trained in wilderness first aid, and all of the certifications necessary for the specific itineraries. Okay, give us a short list, what can’t you leave home without when you travel? I’ve learned to bring my own tea. I don’t drink coffee and it’s just nice to have the comforts of a good cup of familiar chai when I’m away. But when I’m in India or Nepal, my chai can’t compare to theirs. I also bring my GSM international phone so that I can stay in touch with home easily with text messages. And my sarong, which has so many uses, as a bag, beach towel, blanket, protector from the sun, skirt and bathing towel. Any new destinations for BikeHike Adventures next year? We are offering lots of new destinations next year including Laos, Cambodia, Romania, Newfoundland and Vancouver Island, and we’re working on a new itinerary that will be launched in 2009 that is a winter multi-sport adventure in British Columbia, just in time for the 2010 Winter Olympics in Whistler, BC, Canada. Do You Still Believe in These 15 Travel Myths?